If we had to pick our favourite ice cream, it will have to be vanilla bean or Espresso Coffee. You can't help but fall in love with the coffee and kahlua combination. Definitely an adult dessert, not recommended for children. 1. Pour milk and sugar into a saucepan. Using a sharp knife, split the vanilla beans in half lengthways. Scrape out the seeds and add the pod and seeds into the milk. Heat on medium-low to a simmer point (do not allow to simmer). 2. In another container whisk the eggs. Gently whisk the hot milk into the egg mixture to temper it. 3. Return the entire mixture, half the cream, Espresso and salt into the saucepan and heat on medium-low heat until custard consistency stirring all the time (5-10 minutes). 4. Remove custard from the heat. Lightly whip the remaining cream and add to the custard. 5. Add Kahlua. Stir well to combine. Strain for a smoother ice cream (optional). 6. Cover the top of the mix with a clingwrap to prevent a skin from forming. 7. Refrigerate overnight to let the flavour develop. 8. Remove vanilla beans. Churn in ice cream machine and add some of the choc chunks. Spoon mixture into an airtight container, sprinkle the rest of chopped chocolate on top. Freeze for several hours. 9. Leave at room temperature for 5-10 minutes before serving. 1. The vanilla bean can be substituted with 1 tsp vanilla extract. 2. The texture of the ice cream will always be the best on the day it is made. 3. Add more sugar if you have a sweet tooth. The ice cream will be softer if kept as near the top of the chest freezer as you can. The grown up flavors in your ice cream sound divine :D! espresso ice cream is always one of my favorite. yum yum, too bad i don't have an ice cream maker to try this. Oh i once tried vanilla and basil flavored ice cream too. Love the tinge of the basil. Maybe you should experiment. Chaokar - If I ever grow basil in my garden, I might try throwing some in. Mmmm...I love products that incorporate alcohol! I always think they're so creative and delicious sounding! I made this the other day (with full-fat milk) and thought it was divine. Thanks for sharing. 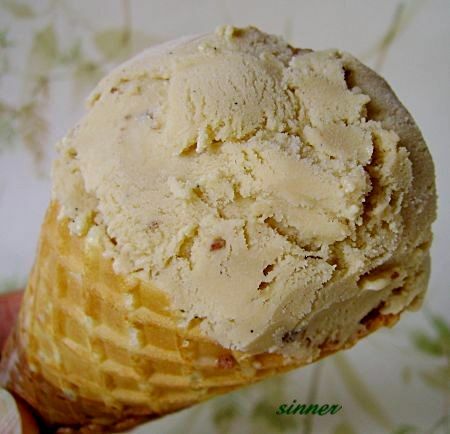 NAOmni - you will fall in love with this ice cream. Foodfreak - Glad you like this alcoholic dessert. Thanks for the feedback. I have always loved coffee flavored ice creams! They are the most delicious ever!